JONESTOWN, TX--(Marketwired - February 19, 2017) - Bryan Thrift of Shelby, North Carolina, brought a five-bass limit weighing 11 pounds, 7 ounces to the scale Saturday to reclaim the lead after day three of the FLW Tour at Lake Travis presented by Quaker State. Thrift's three-day total of 45-9 makes him the No. 1 seed on championship Sunday as the field is now cut to the final 10 anglers in the event that featured 164 of the top bass anglers in the world casting for a top cash award of up to $125,000. In second place is General Tire pro Mark Rose of West Memphis, Arkansas, with a three-day catch weighing 44-9. Hometown favorite Clark Wendlandt of Leander, Texas, brought a five-bass limit to the scale weighing 12-2 to move into third place with a three-day total of 41-12. 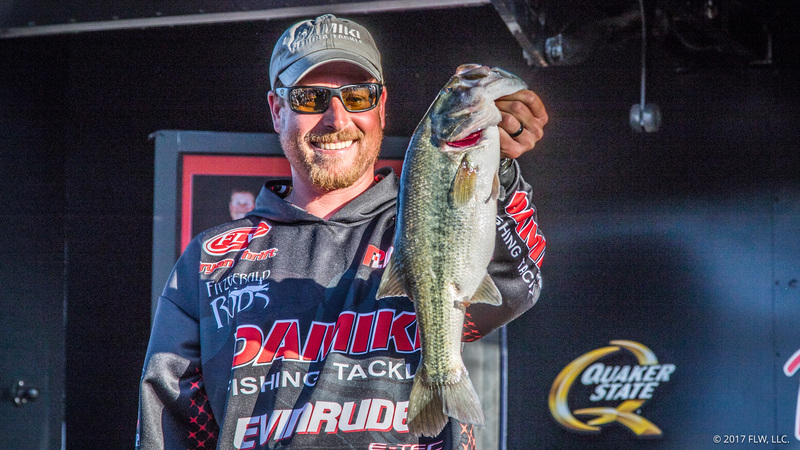 "I caught around 40 bass today between four areas," said Thrift, who finished in second place when the Tour last visited Lake Travis in 2007. "Some areas were deep, and others were shallow. The whole key today was going for a big bite. "I caught three that I weighed in off of a secondary point, and the rest were scattered here and there," continued Thrift. "The point had bare spots within the trees and bushes -- that's what I caught a lot of bass out of today, but they were too short." Thrift said his primary bait Saturday was a crawfish-type soft-plastic. "The other two fish in my limit came off of a jig," said Thrift. "I ran down the bank and threw to everything in front of me. I needed to get a big bite and got two." The North Carolina pro said he plans on fishing both deep and shallow again on the final day. "I don't know what the weather is going to do to the fish that are up shallow tomorrow," said Thrift. "I'd love for it to be sunny and calm like it was today, then I'd feel like I have a strong chance to do well." Overall there were 72 bass weighing 149 pounds, 6 ounces caught by 19 pros Saturday. The catch included nine five-bass limits. Pro Stephen Patek, who started the day in first place, received a 4-pound penalty Saturday for violation of FLW Tour rule No. 16 regarding check-in times. The rule states that anglers who are not at the check-in area at the appointed time will be penalized 1 pound per minute. Patek also weighed in a deceased fish and received an additional 4-ounce penalty. Pro Dylan Hays, who started the day in seventh place, was also in violation of rule No. 16, but only received a 1-pound penalty. David Larson of Mound, Minnesota, won the Co-Angler Division and $20,350 Friday with a two-day total of six bass weighing 21 pounds, 10 ounces, followed by Thomas Martens of Jonestown, Texas, who finished in second place with 10 bass weighing 20 pounds, 11 ounces worth $7,550. In FLW Tour competition, pros and co-anglers are randomly paired each day, with pros supplying the boat, controlling boat movement and competing against other pros. Co-anglers fish from the back deck against other co-anglers. The full field of anglers competes in the two-day opening round. Co-angler competition concludes following Friday's weigh-in, while the top 20 pros based on their two-day accumulated weight advance to Saturday. Only the top 10 pros continue competition Sunday, with the winner determined by the heaviest accumulated weight from the four days of competition. The final 10 anglers will take off at 7 a.m. CST Sunday from Jones Brothers Park, located at 10301 Lakeside Drive, in Jonestown. Sunday's championship weigh-in will be held at Jones Brothers Park beginning at 4 p.m. Prior to the weigh-in Sunday, FLW will host a free Family Fishing Expo at Jones Brothers Park from noon to 4 p.m. The Expo is a chance for fishing fans to meet their favorite anglers, enjoy interactive games, activities and giveaways provided by FLW sponsors, and learn more about the sport of fishing and other outdoor activities. The FLW Tour at Lake Travis is hosted by the City of Jonestown and the Austin Sports Commission. Television coverage of the FLW Tour at Lake Travis presented by Quaker State will premiere in high-definition (HD) on NBC Sports Network (NBCSN) April 12 from 12:30 p.m.-1:30 p.m. EST. The Emmy-nominated "FLW" television show airs on NBCSN, the Pursuit Channel and the World Fishing Network and is broadcast to more than 564 million households worldwide, making it the most widely distributed weekly outdoors-sports television show in the world. FLW is the world's largest tournament-fishing organization, providing anglers of all skill levels the opportunity to compete for millions in prize money in 2017 across five tournament circuits. Headquartered in Benton, Kentucky, with offices in Minneapolis, FLW conducts more than 274 bass-fishing tournaments annually across the United States and sanctions tournaments in Canada, China, Mexico, South Africa and South Korea. FLW tournament fishing can be seen on the Emmy-nominated "FLW" television show, broadcast to more than 564 million households worldwide, while FLW Bass Fishing magazine delivers cutting-edge tips from top pros. For more information visit FLWFishing.com and follow FLW at Facebook, Twitter, Instagram, YouTube and Snapchat: @FLWFishing. Pro angler Bryan Thrift of Shelby, North Carolina, will lead the final 10 anglers into day four of competition with a total catch of 15 bass weighing 45-9.